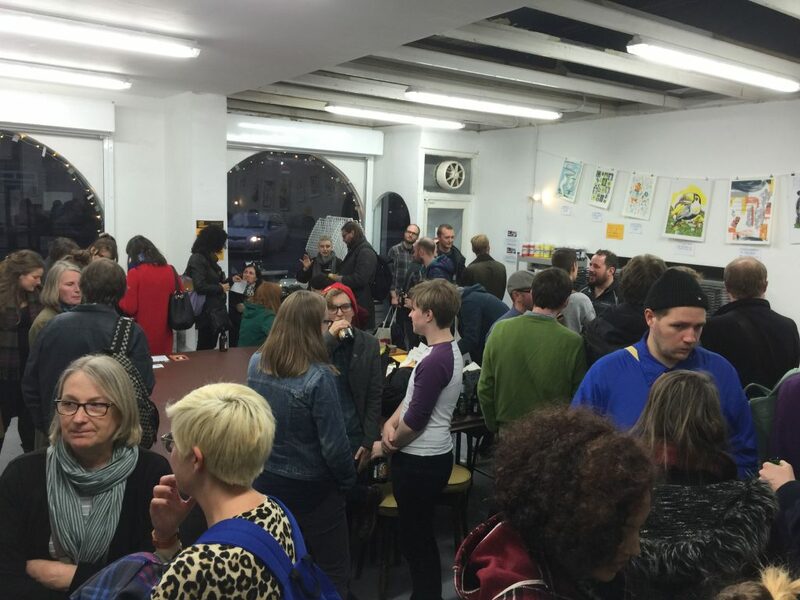 A huge thank you to all the folks who came out to the official launch of Leeds Print Workshop on Friday night. The space was absolutely packed throughout the evening, with old friends and new coming to see the finished workshop. Congrats to all the winners of our launch night art tombola – a lot of people walked away with some nifty prints. And extra congratulations to our guests for how much beer, wine and other beverages you managed to put away. Seriously guys, we went on four extra beer runs! Extra thanks to Firestone Walker brewery for donating several cases of delicious IPAs and Pilsners. Quite a few of our fundraising prints were sold as well, which all goes towards our equipment fund. Regular opening hours have now begun at the Workshop, with doors open from 10:30am until 4:30pm on Friday, Saturday and Sunday. Those with memberships can now use the facilities within these times – and we’re hoping to extend the hours in the future. But the Workshop doors are also open for anyone who just wants to come in and chat, ask questions, and look around the space. So if you didn’t make it to the official launch night, just pop in to see us over the weekend!